For his "Executive Decision" segment on Friday's Mad Money program, Jim Cramer sat down with Kim Blickenstaff, executive chairman of Tandem Diabetes Care (TNDM) , a stock that has soared an incredible 1,942% over the past year. Blickenstaff said that Tandem has the best touchscreen insulin pump on the market and after consolidation in the industry, now exists in a duopoly with only Medtronic (MDT) . Blickenstaff added that Tandem has taken a consumer electronics approach to diabetes management, making sleek, stylish products. The latest technology and algorithms do most of the work managing insulin, leaving the patient to mostly just monitor the results. Tandem has also partnered with DexCom (DXCM) , which makes the latest technology in blood glucose monitoring. As the stock has been rising, the company has been issuing additional shares using the proceeds to pay down debt so now it is a debt-free company. Sounds like promising fundamentals but are we late to the game with the stock up so much? Let's check out the charts this morning. In this daily bar chart of TNDM, below, we can see that prices rallied from $5 to over $50 in just a little over six months. The stock consolidated those gains until last month when TNDM broke out to new highs with an upside breakaway gap. Notice how the volume of trading expanded from March to September? That's good confirmation of the price action with volume. Volume dried up during the sideways consolidation patter through February but the On-Balance-Volume (OBV) line remained steady telling us that the longs did not liquidate (sell). The Moving Average Convergence Divergence (MACD) oscillator has confirmed the price action and is bullish now. In this weekly bar chart of TNDM, below, we can see how the stock collapsed from $110 to nearly nothing! A near death experience. Today prices are above the rising 40-week moving average line. Volume has moved up with prices, the weekly OBV line is bullish as is the weekly MACD oscillator. 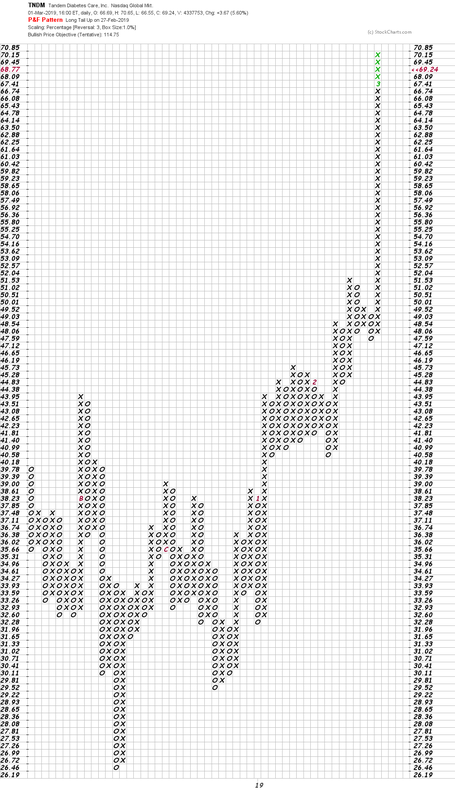 In this Point and Figure chart of TNDM, below, we can see an upside price target of $114 being projected. Bottom line strategy: Our Point and Figure chart is showing us a $114 price target but the real question is what do we risk to go long here? Probably a close below $55.